Last year I took part in some filming for an episode of Heir Hunters, the BBC's genealogy / fortune-hunting reality-documentary show. Rather delightfully, the trail in this particular case led back to Nellie Grant, daughter of President Ulysses S. Grant, who married English rotter Algernon Sartoris at the White House in 1874 - and that's what I was brought in to talk about. The episode aired today and should be available here. It tells this remarkable story very nicely. But I thought it would also be interesting to share some of the primary source material that I uncovered during the course of my research for the episode - of which there's no shortage. 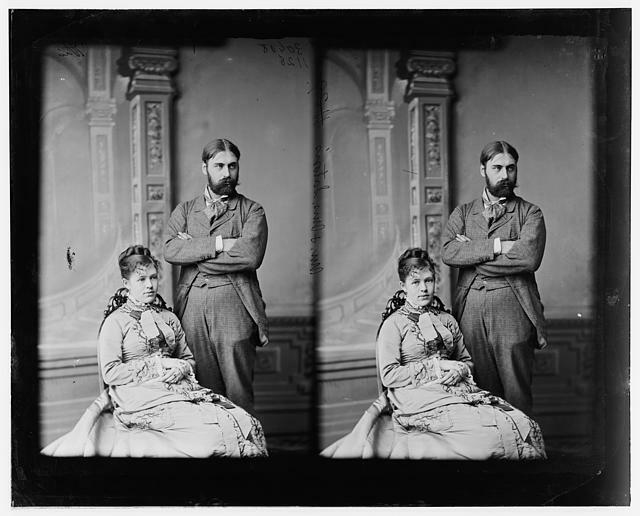 This relationship made a large impact in Gilded Age America, and left an equally large footprint. While it's probably pretty banal to point out how contemporary the story feels, I still find it remarkable how much detail about this Transatlantic wedding - and the unhappy marriage that resulted - can be traced in the popular press, in the correspondence of the great and the good, and even in the literary history of the period. 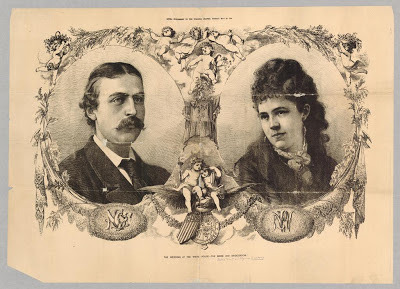 Celebrity wedding of the nineteenth century? I think it has a good claim to that title. What follows are a few highlights. "Mr. President, I want to marry your daughter." 1. It is symbolically delightful that Nellie Grant met and fell in love with Algernon Sartoris on a Transatlantic voyage. Fun fact: Algernon was the son of renowned opera singer Adelaide Kemble - sister of Frances Kemble. Yes, that's the same Fanny Kemble who married Georgian planter Pierce Butler before writing her Journal of a Residence on a Georgian Plantation. That's a pretty rich family history of unhappy Transatlantic unions. Second fun fact: Nellie and Algernon were married in 1874, the same year that Lord Randolph Churchill married American heiress Jeanette Jerome. Something was in the air, clearly. But before they were wed, Algernon had to ask the President for his permission to marry his favourite child. 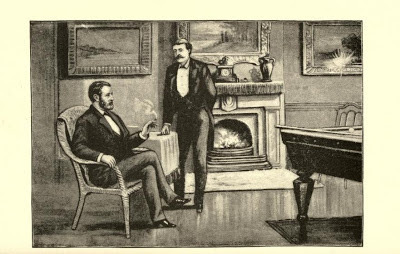 That conversation is outlined in gloriously awkward detail in the memoirs of Grant's secretary, Adam Badeau, available here. 2. 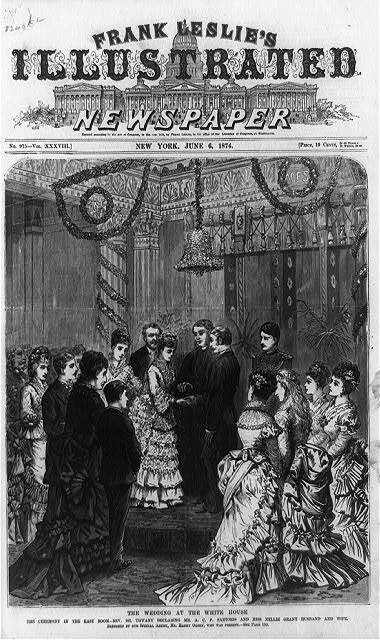 The wedding itself was covered widely in the popular press. It made the cover of Frank Leslie's, left. Probably the most easily accessible account of the day can be found in this story in the New York Times. Fun fact: Walt Whitman wrote a poem to commemorate the wedding, "A Kiss to the Bride", published in the New York Daily Graphic, and available here: "O youth and health! O sweet Missouri rose! O bonny bride!" Whitman wasn't the only writer to pay attention to the event. John Greenleaf Whittier was after gossip and, apparently, fashion tips, writing to Gail Hamilton: "of course thee saw the great wedding at the White House. Sometime thee shall tell me all about it, especially about the ladies' dresses, in which thee knows I have a particular interest." Who would have guessed? 3. As I've already hinted, the marriage was not a happy one. By most accounts (see below) Algernon was a drunk and a philanderer. The latter got him into some rather awkward public trouble in 1883. By that point, Nellie and Algie were already essentially separated. Ironically, while Nellie was still based with her in-laws in Britain, Algernon was spending more time in America, at a farm he'd purchased near Milwaukee. In June that year, the New York Times published details about Algernon's alleged misadventures with an English widow named as Mrs. Bush. Happily for us, less so for Nellie, the whole sorry affair is available here, underneath the arresting headline: "The Bewitching Mrs. Bush: A Comedy in Which Algernon Sartoris and Some Tradesmen Take Parts." I dare you not to read it after that billing. "poor little Nellie Grant sits speechless on the sofa, understanding neither head nor tail of such high discourse and exciting one’s compassion for her incongruous lot in life. She is as sweet and amiable (and almost as pretty) as she is uncultivated." "She is illiterate, lovely, painted, pathetic, and separated from a drunken idiot of a husband. The Sartorises don't like her much, but they like her more, I suppose, than they do their disreputable "Algie." Whenever I see her there is something rather touching and tragic to me [...] in a strange land, quite without friends, ignorant, helpless, vulgar, untidy, unhappy, perfectly harmless and smeared over with fifteen colours." But tantalisingly (fun fact alert), here James also suggests that Nellie gave him the material for his short story "Georgina's Reasons". It doesn't seem too much of a stretch to think that Nellie's "touching and tragic" life and example might have provided equally fruitful food for thought for James in and of itself. At some point down the line I think I'll write a little more about Henry and Nellie. It seems like a rich seam. Academic and writer. Author of River of Dreams: Imagining the Mississippi Before Mark Twain (Louisiana State University Press, 2007) and Southern Queen: New Orleans in the Nineteenth Century (Continuum, 2011). More information available at Thomas Ruys Smith. I blog about my adventures in nineteenth century literature at American Scrapbook. American Scrapbook by Thomas Ruys Smith is licensed under a Creative Commons Attribution-NoDerivs 3.0 Unported License.